Chinese material scientists have been studying the design of butterfly wings to unlock ways to make solar electricity more efficient. 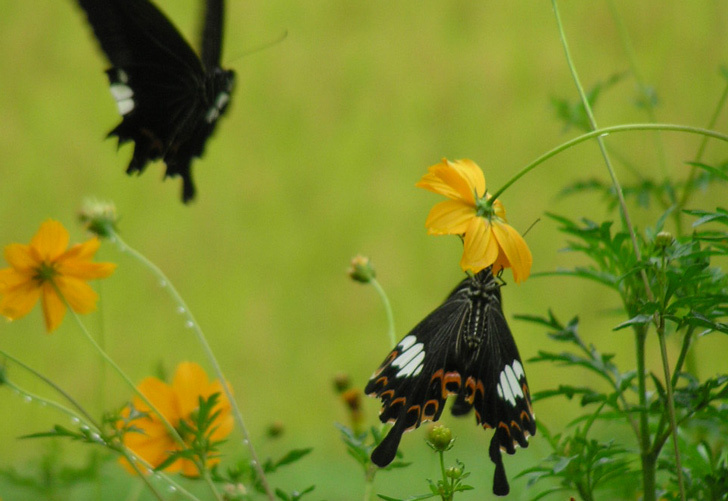 Inspired by the way that butterflies use their wings to collect solar heat, researchers at Shanghai Jiao Tong University took a closer look at the wings’ makeup. What they found was a shingle-like structure whose complex shape allows light to fall to the lower layers, doubling the light-gathering potential. The insight could pave the way to electric solar panels which can produce much more energy in a smaller area. The discovery was unveiled at the American Chemical Society’s annual meeting with lead scientist Dr. Tongxiang Fan explaining how the intricate shape of the scales in the wings allows for better solar absorption. The research pivots on classic biomimicry design. They looked at two species of black butterfly wings which best absorb heat. The wings are made from elongated scales layered in offset rows like shingles on a roof. Raised ridges in the scales contain tiny holes on the edge to allow light be funneled to the scales below. The technique maximizes light-gathering potential and helps the butterfly heat up quickly on a cool morning. The scientist made a model of the wing to test its effectiveness. The model used titanium dioxide which acts as a photocatalyst in splitting of H20 when exposed to light. The findings showed a doubling of the production of hydrogen from the wing design compared to a flat surface. Dr. Fan said that “the prototype is very, very effective,” and he is looking to commercialize the findings. The research looks like a promising avenue for three dimensional solar arrays which capture light in more complex ways than traditional flat arrays. Chinese material scientists have been studying the design of butterfly wings to unlock ways to make solar electricity more efficient. Inspired by the way that butterflies use their wings to collect solar heat, researchers at Shanghai Jiao Tong University took a closer look at the wings' makeup. What they found was a shingle-like structure whose complex shape allows light to fall to the lower layers, doubling the light-gathering potential. The insight could pave the way to electric solar panels which can produce much more energy in a smaller area.